30 Seconds To Mars fans, get excited! 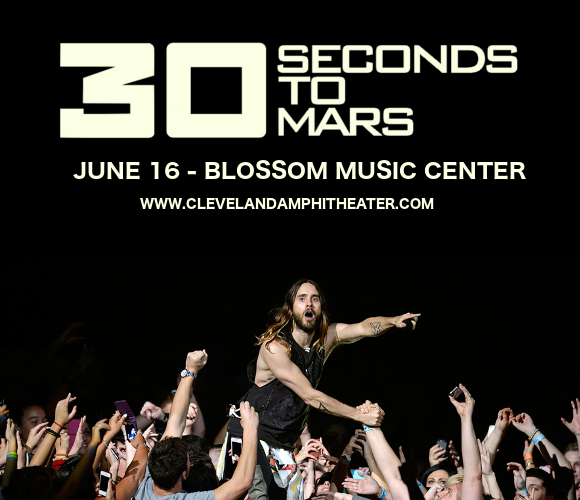 Blossom Music Center is playing host to Jared Leto’s phenomenal alt-rock band, joined by indie rockers Walk The Moon, pop-rock act MisterWives and indie pop band Joywave! With a lineup like this, the show promises to be truly out of this world! Coming to the Blossom Music Center live on Saturday 16th June 2018 – hit the “Buy Tickets,” button now to grab YOURS! 5 years on from their last album, 2013’s “Love, Lust, Faith and Dreams,” 30 Seconds To Mars have announced an all-new release and the huge 2018 tour, dubbed “The Monolith,” to accompany it. Fans can expect performances of all their favourite songs, including "The Kill,” “Up in the Air,” and “City Of Angels,” alongside plenty material from the as-yet-unnamed release. The new album is scheduled for release on April the 6th – giving fans loads of time to get familiar with all the new material and ready to scream along live with Jared Leto and the rest on June the 26th!! Don’t delay – grab your tickets to catch this fantastic set of alternative rock acts live NOW while they last! !